Welcome to WelkinLight Photography’s guide to the Korean seasons. This is a work in progress that I will build on over time to help you understand Korea’s seasons and what to expect for your photography session. Korea’s weather is extremely changeable, but this guide should give you an overview of the seasons and what they mean for us. Spring is the most coveted season in Korea. The long winter has come to an end and the world is starting to come back to life. Starting from mid-March the weather gets warmer during the day (although, it’s still cold at night) and there are hints of green starting to reappear around the country. At this time, the air gets thicker with pollution and we don’t get so many nice sunrises or sunsets. The warmer days mean that it’s a great time to head out to Seoul’s palaces or use the city as a backdrop in photos. By the end of March, you can expect to see Forsythias and Azaleas blooming, but greenery will not have returned yet. By mid-April, we’re usually starting to see flowers all around the city. The cherry and plum blossoms will bloom around this time. These can be extremely beautiful and are found all around the country. In Seoul, some great places to make the best of them are the palaces and parks. It is important to remember that these blooms are extremely fickle and fragile. They are greatly affected by the weather. Warm days will cause them to blossom more quickly, and rain or wind will knock them off the trees just as quickly. If we’re lucky in Seoul, they’ll be around for a week at most. If you’re planning to have your photo session at this time, it’s best to be flexible with your date and time so that you can make the most of these. If you’re ready to brave the crowds, check out the Cherry Blossom Festivals. They’re not great for photos due to the number of people, but they can be fun. When May begins, we’re seeing a lot more green around the city. The trees are mostly covered with the fresh greens of new life, and the grass is also mostly green. May can still have some cool nights, but for the most part, early summer has begun. If we get clear days at this time, these can be some of the most beautiful moments of the year. Spring is a great time for your photo session, but it’s also the busiest time of year for us here. Get in early to make sure you get the date you want! Overall, Korea’s summer can be quite hot. Although the temperatures only soar into the high 30s a few times over the summer, the humidity can make the days unbearable. Because of this, we have a lot of hazy days and the air can be quite stifling. Be prepared to drink lots of cold water and learn to love air-conditioning. This is the hot time of year. June is very much like May. It’s still beautiful and green with new life, but the nights are no longer cool. Usually, we’ll get a few days of rain in June, and that keeps the greens verdant and the air clear for a while. On these days, we’ll get beautiful light and clear skies. June is a great time for photography. July usually starts to get very hot and humid. Air quality drops quite a bit and the greens of spring are starting to dull. We can still expect beautiful days after rain, which does happen from time to time. August is the time for escaping the heat. It can be oppressive at times, but this is also the month of storms. We’re likely to see quite a bit of rain, and perhaps a typhoon. These may seem like a curse, but the few days after these storms are some of the most beautiful of the year. If you’re lucky, you’ll have a session with clear skies during the day and a beautiful sunset. Just remember to keep your fluids up. It’s really hot! September starts to cool down quite quickly. Although the flowers are gone and the trees have lost the greens of new life, the warm days make this a great time for photography. We still get clear air and sometimes beautiful blue skies and puffy white clouds. 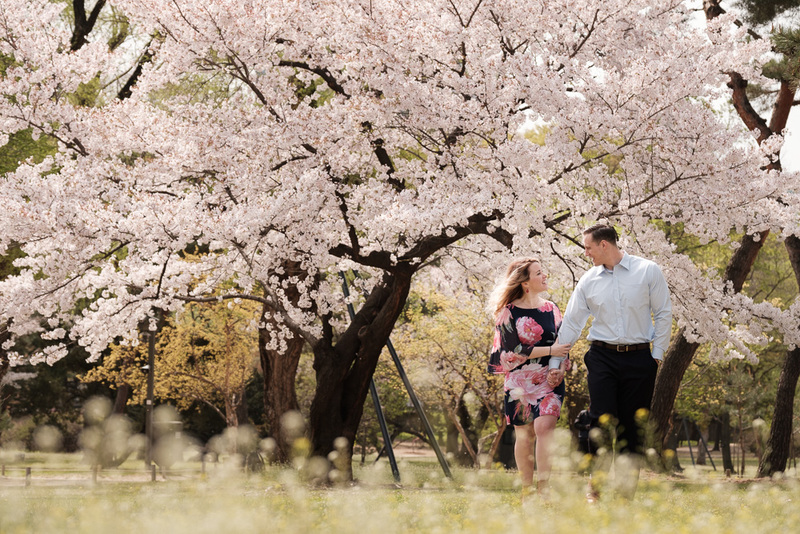 This can be a great time to hit the parks in Seoul for a family or couple session. October starts to get a little cooler. By the middle of the month, you’ll start to see the trees beginning their cycle towards autumn and the colours will start to show. By late October, we can start thinking about our autumn photography sessions with the beautiful hues of orange, red, and brown. Early November continues this trend and also has some of the warmest sunsets of the year. The light is simply beautiful at this time of year, and I recommend it over all other times of year in Seoul for a sunset photo shoot. It does start to get quite cold and windy, however, so remember to dress appropriately. Korea’s winter can be beautiful from inside a warm cafe, but don’t forget that temperatures are often sub-zero outside. Seoul itself doesn’t get a lot of snow and when it does, it turns to brown slush fairly quickly with the constant movement of people and cars. 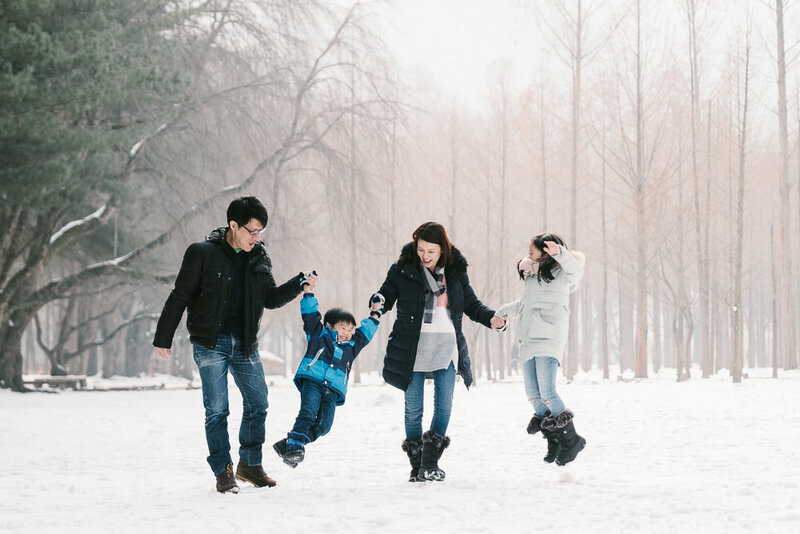 If you’re looking for a session in the pristine snow, you can increase your chances by heading out to somewhere like Nami Island or for even better chances, somewhere like Inje in Gangwondo. December is a month of crisp air and blue skies. Freezing temperatures are usually only had over night and you can expect cold, but not biting temperatures during the day. By now, there are no leaves on the trees and everything is a similar shade of brown. There are still possibilities for photography sessions, but I do not recommend hoping for nature as a background. This time of year is better suited to the palaces and city scenes. January and February are bitterly cold. Heading out into the countryside at this time for snow shoots can be a great idea. At this time of year, Nami Island can be really nice, especially in the early morning or late evening when the crowds are gone. I hope that this has helped you understand Korean seasons and what you’ll be getting yourself into at a given time of year. Check out my location guide to give you some ideas of where you might want to have your session as well.